It’s Fed day and the market will try to get it together for the event risk, with plenty already going on in the lead up. The week thus far has been consumed by the US midterm election, which has produced a reaction of buying back into risk and selling the US Dollar. The Euro is trying to turn back up after setbacks stalled out into the 2018 low from August. The latest break back above the previous weekly high strengthens the recovery prospect, though a push through 1.1620 is what will be required now to get the market thinking about an uptrend again. 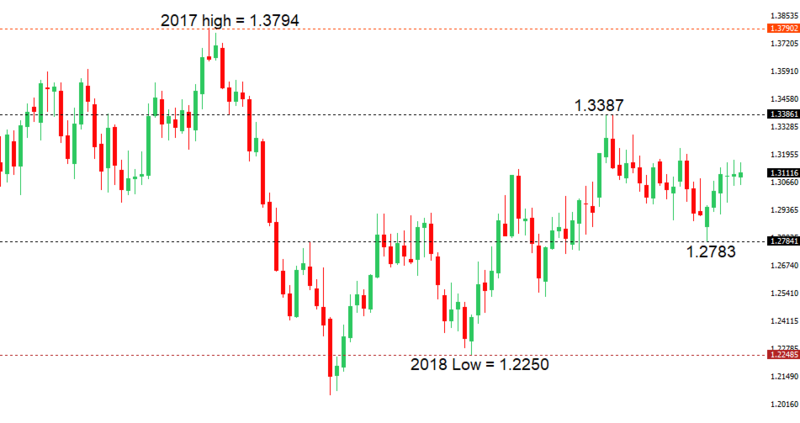 The Euro has been better bid into this week on the back of a round of profit taking on US Dollar longs and some added Dollar selling in the aftermath of the US midterm election which saw the Democrats gaining control of the House. The news of the US House being reclaimed by the Democrats has inspired renewed risk appetite and broad Dollar selling on the back of an expectation that this will put the brakes on the administration’s populist ambitions and welcome a de-escalation of trade war tension. We've also seen ongoing back and forth between the EU and Italian government relating to Italy's budget saga, though this hasn't escalated to any point where the market is all that concerned. As far as today goes, we get German trade data and Eurozone growth forecasts before the market then turns its attention to the Fed decision. On a medium to longer term basis, the outlook is still looking constructive off the +30 year low from 2016, with a higher low sought ahead of the next major upside extension back towards and through the current 2018 high. Right now, the major pair will need to hold up into the latest round of setbacks and push back through critical resistance in the form of the September high at 1.3300 if it wants to strengthen bullish prospects. The Pound has a lot on its hands right now, contending not only with speculation of a Brexit deal in the days ahead, but also with the latest result in the US midterm election, in which the Democrats took the House. The initial reaction to the news has been broadly US Dollar bearish, with the market presumably selling Dollars on the view that this will put the brakes on the administration’s populist ambitions and welcome a de-escalation of trade war tension. And yet, a de-escalation of trade war tension also means the US administration potentially losing momentum on soft Dollar trade policy, which makes this all more difficult to read. Looking ahead, the market will continue to try and digest the impact of the election results, while keeping a close eye on Brexit updates and prepping for the Fed decision late in the day. There is no first tier data on the UK docket. Rallies continue to be very well capped on a medium-term basis, with the outlook still favouring lower tops and lower lows. Look for yet another topside failure ahead of 114.00, in favour of the next major downside extension towards key support around 109.75. 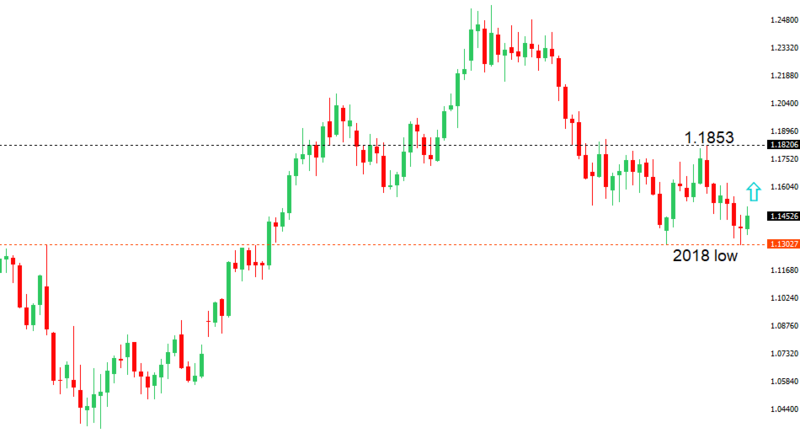 Ultimately, only a break back above 114.75 would negate the bearish outlook. The Yen has been trying to figure out what it all means in the aftermath of this latest US midterm election result which had the Democrats regaining the House. The initial reaction has been one of risk on, which has opened some more upside pressure on USDJPY. Still, it doesn't seem like all of this has been fully processed yet and the market might be neglecting the possibility that this new dynamic in the US government will make the divide among the parties even more contentious. Overall, election aside, we are still looking at the end of an era of massive policy accommodation and the start to ramped up policy normalization that should not bode as well for risk assets, and by extension, could invite another round of upside in the Yen (USDJPY lower). Looking ahead, the market will continue to digest the election result, while positioning ahead of today's Fed event risk. 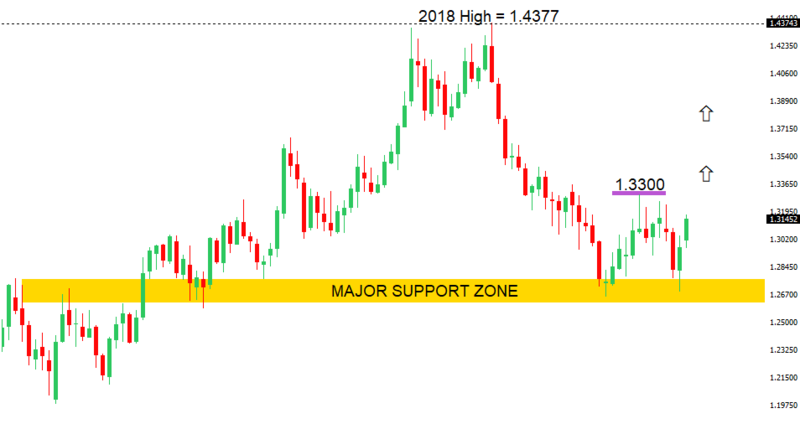 The market has been in the process of recovering out from a 2018 low coinciding with critical support in the 1.1200 area. However, at this stage, there is no clear directional bias, with the price action deferring to a neutral state. Back above 1.1560 would get some bullish momentum going for a push to 1.2000, while back below 1.1200 would be quite bearish. The SNB remains uncomfortable with Franc appreciation and continues to remind the market it will need to be careful about any attempts at trying to force an appreciation in the currency. But the SNB will also need to be careful right now, as its strategy to weaken the Franc is facing headwinds from a less certain global outlook. Any signs of sustained risk liquidation between now and year end, will likely invite a very large wave of demand for the Franc that will put the SNB in the more challenging position of needing to back up its talk with action, that ultimately, may not prove to be as effective as it once was, given where we're at in the monetary policy cycle. Technical studies are stretched on a medium term basis, though the market has been unable to make any meaningful recoveries out from its lowest levels since February 2016. 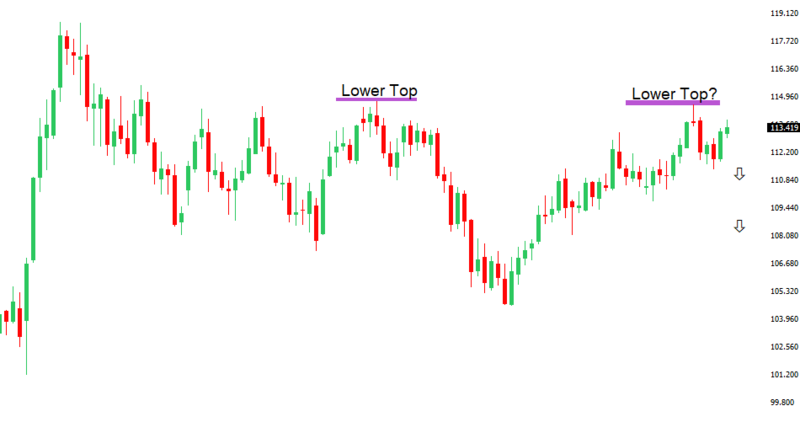 At this stage, the market will need to establish back above 0.7316 to take the immediate pressure off the downside. 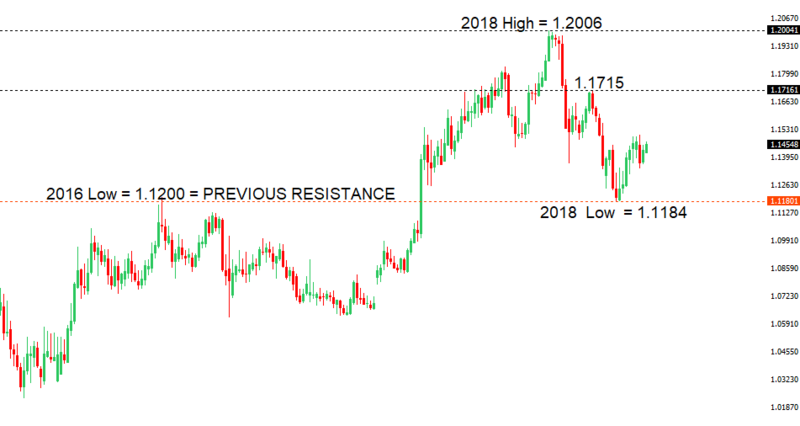 Until then, risk remains for fresh downside below the 0.7000 psychological barrier, which defends against a retest of the 2016 low down at 0.6830. 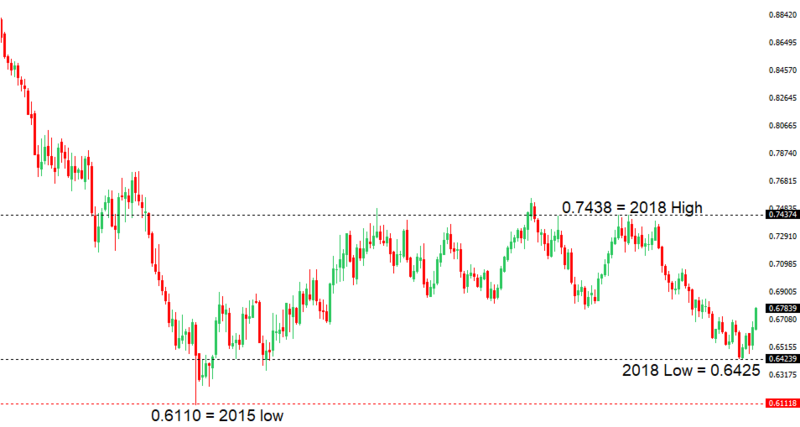 Aussie data has been better of late, the RBA sounded a little more upbeat earlier this week and the US Dollar has come back under some pressure across the board in the aftermath of the US midterm elections. All of this has been helping to rally Aussie further off recent +2.5 year lows against the Buck, with the currency getting another boost on Thursday from the much better than expected trade data out of China. Looking ahead, the market will start to position for the Fed decision due late in the day. The market has been under pressure since topping out in June, which could still invite a deeper decline before the next upside extension gets underway. Still, look for any weakness to be well supported ahead of 1.2500 with only a break back below this psychological barrier to negate the bigger picture constructive outlook. The Canadian Dollar has been a clear laggard over the past week, down against a weakening US Dollar and only managing to outpace the Yen in the developed currency space. A lot of this is a function of some softer data reads out of Canada in recent days, along with a sharp pullback in the price of OIL. Looking ahead, the market will be keeping an eye on those OIL prices and positioning ahead of today's Fed decision. The market has been in the process of recovering out from +2.5 year lows and is looking to extend the correction following the latest break back above consolidation resistance around 0.6725. This sets the stage for a push that could extend back towards the psychological barrier at 0.7000 before the market considers the legitimacy of the recovery and prospect for a more significant bullish structural shift or bearish resumption. 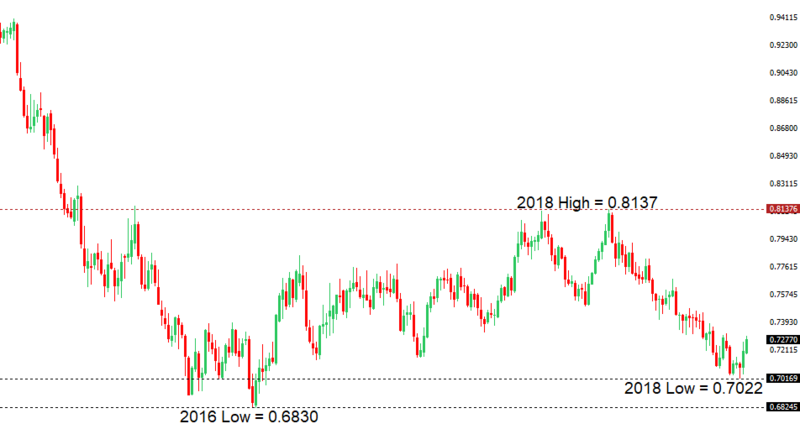 The New Zealand Dollar has been a star performer this week, with the currency getting a boost from a number of fronts including solid employment data, broad based declines in the US Dollar, risk on price action in the aftermath of the US midterm elections and this latest China trade data that came in much better than expected. Looking ahead, the market will turn its attention to the latest FOMC policy decision due later in the day. A market that has been extended on the monthly chart is at risk for a major correction, with the possibility for a massive topping formation. Any rallies should now continue to be very well capped ahead of 3000, in favour of renewed weakness back below the 2530 area yearly low (neckline) and towards a retest of strong longer-term resistance turned support in the form of the 2015 high at 2140. 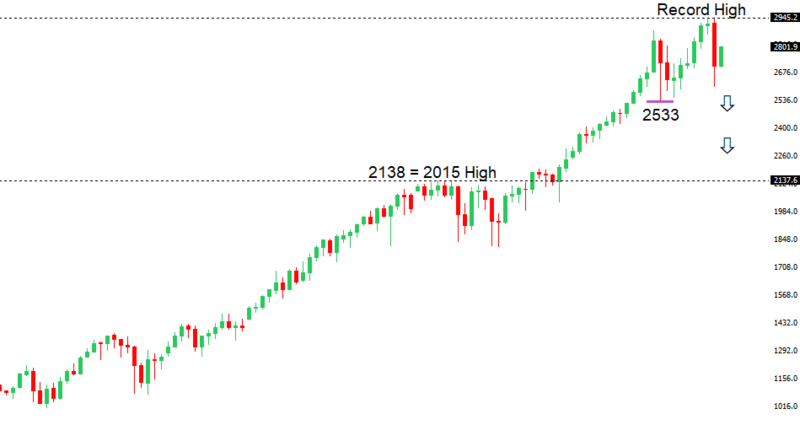 Only a weekly close above 3000 would negate the outlook. Investor immunity to downside risk is not as strong these days. The combination of Fed policy normalisation, US protectionism, ongoing White House drama and geopolitical tension are all warning of capitulation ahead, despite this latest run to record highs. The Fed has also finally acknowledged inflation no longer running below target in 2018, something that could very well result in even less attractive equity market valuations given the implication on rates. We recommend keeping a much closer eye on the equities to ten year yield comparative going forward, as this could be something that inspires a more aggressive decline in the fourth quarter. The market has been showing signs of wanting to turn back up after establishing back above the daily Ichimoku chart. 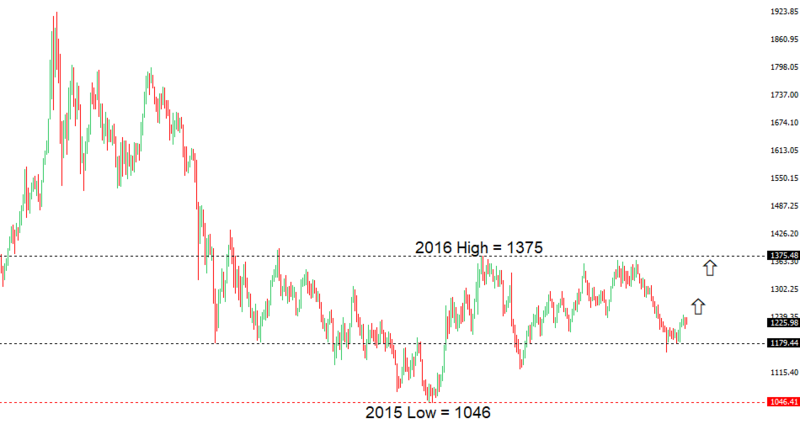 There are also signs that we could be seeing the formation of a more significant medium to longer-term structural shift that would be confirmed if this latest recovery can extend back through big resistance in the form of the 2016 high at 1375. Look for setbacks to be well supported ahead of 1200, with only a close back below 1150 to compromise the constructive outlook. A daily close above 1250 will strengthen the outlook. The yellow metal continues to be well supported on dips with solid demand from medium and longer-term accounts. These players are more concerned about exhausted monetary policy, extended global equities, political uncertainty, systemic risk and trade war threats. All of this should keep the commodity well supported, with many market participants also fleeing to the hard asset as the grand dichotomy of record high equities and record low yields comes to an unnerving climax. Considering the intensity of declines already seen this year, if the market does break to the topside, it could be a bullish signal that gets the trend moving up again. But we would need to see a break above the July lower top at around 8,500 for confirmation. 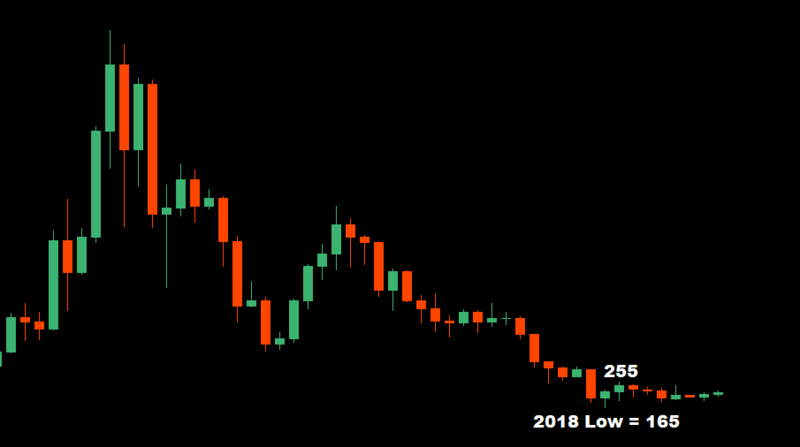 Until then, a bearish continuation back towards the September 2017 low around 2,975 can not be ruled out. 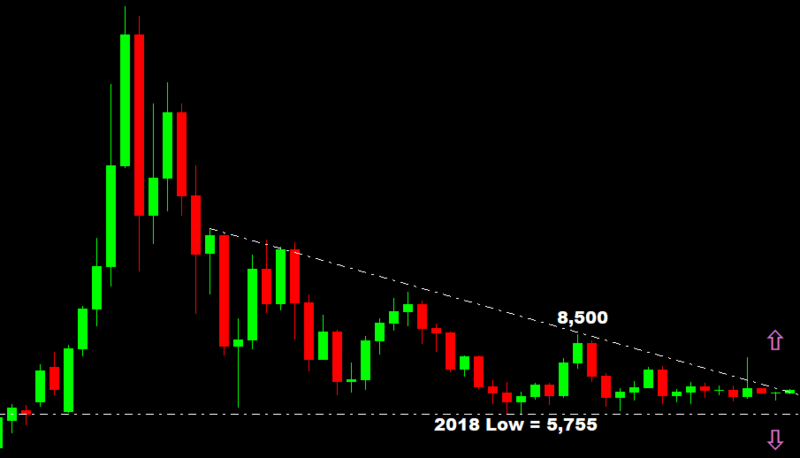 Overall, Bitcoin is doing its best to try and hold up above $6,000 in 2018 after undergoing a massive decline off the record high from December 2017. At the moment, the market has found some stability around the $6,000 barrier, with buyers stepping in on the view that the regulatory challenges will eventually work themselves out, leaving a very bullish picture for a technology with tremendous potential and increasing adoption. Still, there has been concern in the shorter-term on account of regulatory challenges in the space and downside pressure in global equities. The market remains under pressure in 2018, extending its run of intense declines to fresh 2018 lows. Medium term studies are however stretched, which could warn of the start to a recovery. Still, it would take a break back above 255 right now to take the pressure off the downside and suggest that the market could be starting to turn bullish again. Overall, we've seen quite a bit of weakness in the price of Ether in 2018 and there's still legitimate risk for deeper setbacks, given technical hurdles within the protocol, ongoing regulatory challenges and a global macro backdrop exposing risk correlated projects on the Ethereum blockchain. Monetary policy normalisations around the globe and an anticipated reduction in global risk appetite are placing a tremendous strain on ERC20 projects that have yet to even produce proper use cases and proof of concept. At the same time, longer term prospects are looking quite bright and after a drop of well over 70% off the record high, the market is starting to find some stability. Any opinions, news, research, analyses, prices or other information ("information") contained on this Blog, constitutes marketing communication and it has not been prepared in accordance with legal requirements designed to promote the independence of investment research. Further, the information contained within this Blog does not contain (and should not be construed as containing) investment advice or an investment recommendation, or an offer of, or solicitation for, a transaction in any financial instrument. LMAX Exchange has not verified the accuracy or basis-in-fact of any claim or statement made by any third parties as comments for every Blog entry. LMAX Exchange will not accept liability for any loss or damage, including without limitation to, any loss of profit, which may arise directly or indirectly from use of or reliance on such information. No representation or warranty is given as to the accuracy or completeness of the above information. While the produced information was obtained from sources deemed to be reliable, LMAX Exchange does not provide any guarantees about the reliability of such sources. Consequently any person acting on it does so entirely at his or her own risk. 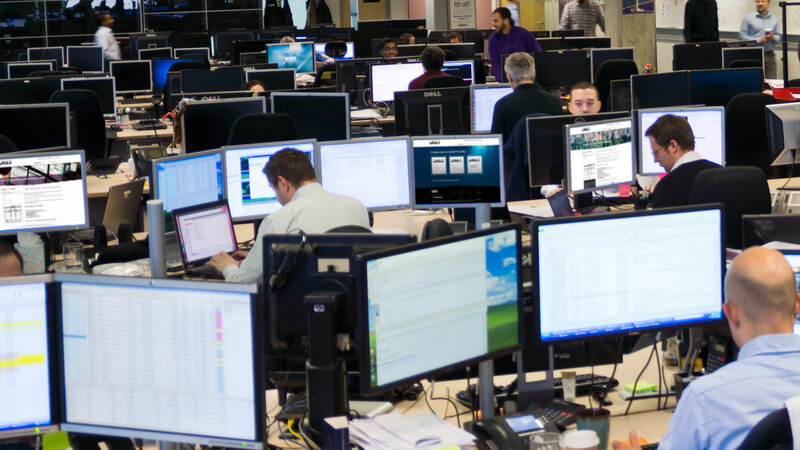 It is not a place to slander, use unacceptable language or to promote LMAX Exchange or any other FX, Spread Betting and CFD provider and any such postings, excessive or unjust comments and attacks will not be allowed and will be removed from the site immediately. LMAX Exchange will clearly identify and mark any content it publishes or that is approved by LMAX Exchange. FX and CFDs are leveraged products that can result in losses exceeding your deposit. They are not suitable for everyone so please ensure you fully understand the risks involved. The information on this website is not directed at residents of the United States of America, Australia (we will only deal with Australian clients who are "wholesale clients" as defined under the Corporations Act 2001), Canada (although we may deal with Canadian residents who meet the "Permitted Client" criteria), Singapore or any other jurisdiction where FX trading and/or CFD trading is restricted or prohibited by local laws or regulations. LMAX Exchange Group is the holding company of LMAX Limited and LMAX Broker Limited | LMAX Exchange is a trading name of LMAX Limited, which operates a multilateral trading facility, authorised and regulated by the Financial Conduct Authority (Reference number: 509778) and is a company registered in England and Wales (number 6505809) | LMAX Global is a trading name of LMAX Broker Limited which is authorised and regulated by the Financial Conduct Authority (Reference number: 783200) and is a company registered in England and Wales (number 10819525) | The registered address for LMAX Exchange and LMAX Global is Yellow Building, 1A Nicholas Road, London, W11 4AN.